I apologize for the lack of a Sunday dinner post this past week, but it was one of those Sundays where I did not have a recipe to share. One where I either didn't have a photo or I was trying a new recipe. This salad would be an example of the latter. I was looking for a mixed green salad that would be suitable for the current season. The star ingredient in this salad is the kumquat. What is a kumquat? It is a citrus fruit that is about the size of a large olive. Unlike an orange, the skin is sweet and the flesh (what little there is) is slightly sour. When both are eaten, it lends a very refreshing flavor to the palate. To soften the skins of the kumquats, they are macerated in the vinaigrette before tossing. To balance the tanginess of the fruit, thinly sliced red onion and toasted pecans are added. I also added a good handful of dried red cranberries for more sweetness and texture. The dressing is a simple white wine vinaigrette that can be made up to one day in advance (always a bonus). Full of color, seasonal ingredients, texture, and full of flavor, this salad hit all the points I was looking for. In a small container or jar, combine the oil, vinegar, mustard, garlic, salt, pepper, and sugar. Cover and shake well. (The dressing can be made up to 1 day ahead.) Add the kumquats to the dressing and shake to coat; set aside to macerate for 30 minutes. Meanwhile, preheat the oven to 375º F. Spread the pecans on a baking sheet and bake until fragrant and lightly toasted, about 5-7 minutes. Let cool, then roughly chop the nuts into smaller pieces. 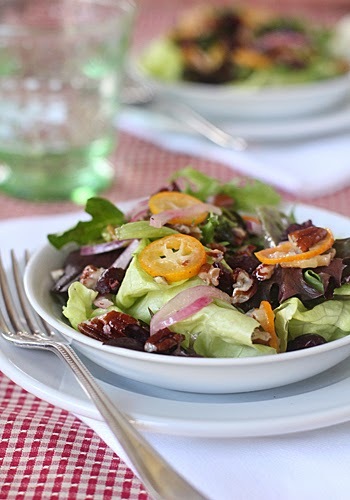 Just before serving, combine the lettuces, greens, sliced onion, pecans, and cranberries in a large bowl. Remove the garlic clove from the dressing, shake well, and pour it over the salad. Toss well to combine. Serve immediately. Enjoy!